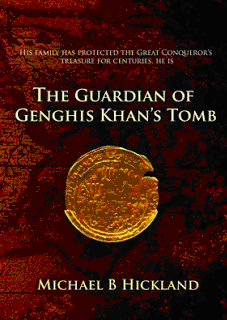 The Guardian of Genghis Khan's Tomb: New Historical Fiction Novel Unearths Fictional Secret of Great Khan’s Empire. In a unique fusion of fact and fiction, Michael B. Hickland brings the world’s greatest Emperor back into the public’s spotlight. When it comes to guarding Genghis Khan’s tomb, what adventures are waiting? Valrico, FL – Even though he died almost nine hundred years ago, the legacy of Genghis Khan has always remained very much alive. With both his life and death capturing the attention of audiences young and old, a gripping new novel by Michael B. Hickland is about to become as timeless as the Great Kahn himself. ‘The Guardian of Genghis Khan’s Tomb’ is a unique historical fiction novel that focuses on the Emperor’s post-life influence. Since 1227, finding the Tomb of Genghis Khan has been the obsession of tyrants, adventurers and treasure hunters. All have failed to find it. It is a Genghis Khan fact that, looking at a map today, he had conquered a geographic area which would include 30 countries and 3+ billion people. The legend says that, in order to keep his tomb’s location secret, Genghis Khan slaughtered hundreds if not thousands of his captives after they had been forced to dig his burial site. He had amassed untold wealth with enormous quantities of jewels, gold and silver from his conquests that are believed to be buried with him. So why hasn’t his crypt been found in almost eight hundred years? In The Guardian of Genghis Khan’s Tomb, the Great Conqueror extracts a sacred oath from a special advisor. It binds both this trusted counsellor and his family forever to protect the tomb and the most immense treasure ever known. Now, in a remote Asian river valley, a beautiful English scientist’s chance discovery of an ancient artefact tied directly to Genghis Khan ignites a furious race among China, Russia and the United States to find that crypt. The stakes are huge, putting the young woman along with her American sponsor at the centre of the confrontation. Can The Guardian of Genghis Khan’s Tomb manage to keep the gravesite safe and his beloved country, a fledgling democracy, from being overrun? Or will war break out between the world’s Superpowers? Michael B. Hickland’s e-novel is a fast paced historical fiction thriller full of turns and twists. As the author explains, his narrative will appeal to an eclectic audience. “Like Ken Follett, Dan Brown, Cussler action with Indiana Jones/Lara Croft thrown in? You'll love this ebook. It’s a story that can be enjoyed by young and old alike. Hang onto your hats!” says Hickland. Since its release, rave reviews have been flooding in from around the nation. “Well written, excellent characters and an amazing story will keep you turning page after page. You'll both be anxious to get to the end and dreading it because you won't want the story to end,” commented one reader, reviewing the book on Amazon. With demand for the book increasing, interested readers are urged to purchase their copies as soon as possible.